Take a look at this gem. Country living at it's best. This 5,040 square foot home would make a fine primary residence, conference center, or wedding venue. 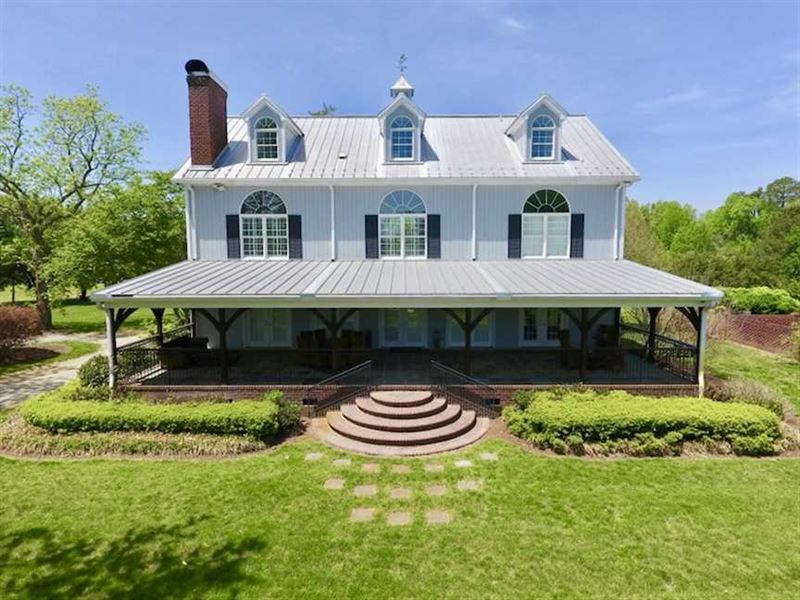 With right at 85 acres of timberland and pasture land, this property offers plenty of room to enjoy God's creation while living in an incredibly fine, custom built home. 84.45 Acres of Residential and Pasture Land For Sale in Edgecombe County NC. There aren't many properties quite like this one. No expense was spared during the building of this three-story custom built home. There is a total of 5,040 +/- square feet. The first floor features a commercial grade kitchen, one full bath, and one half bath. The great room features an elegant fireplace and provides plenty of space for a living area, conference room, or even an event venue. There is a covered back porch that overlooks the rear portion of the property. The second floor features the master bedroom with a master bath, two other bedrooms and a jack and jill bathroom. There is also common area graced by a rustic brick fireplace and views of the pasture land. A washer and dryer are conveniently located in the closet on the second floor next to the elegant staircase. The third floor features another full bath and one more bedroom along with a large family room that would make a great play room or living area. In the back yard there are multiple buildings see photo gallery. The primary building's interior features hardwood floors, a kitchen area, half bath, and another large room that can be used as a game room or office. There is a large covered porch attached to the rear of this building that overlooks the pasture and timberland. A large outdoor brick fireplace is covered just off of that building and is the prefect place to enjoy some time outdoors with family and friends. Other buildings provide storage for lawn equipment, Atv, tools, etc. The stables have water connected to them as well as electricity and a lean-too portion that allows tractors, implements, etc. to be stored in a dry area out of sight. The drive way loops around near the home and encompasses a brick fountain. The entirety of the pasture land is fenced in and currently used for cattle. The cattle can be purchased as well, but are not factored into the listing price of the property. There is an area in the pasture that could possibly be constructed into a pond. All of the timber is mature and is a mixture of older pines and hardwoods that borders Corn Creek. Properties like are incredibly rare. No expense was spared during the construction of this home and surrounding buildings. The attention to detail is astounding. The land is the perfect mixture of pasture land and mature timberland. There is approximately 2,700 +/- feet of road frontage on both sides on Pleasant Hill Road. Documents with the exact square footage and floor plan are also available for serious potential buyers. From the property you are less than 20 minutes from Rocky Mount and Wilson. Tarboro and Pinetops are less than 30 minutes away and you can be in Greenville in approximately 40 minutes. Raleigh is approximately an hour from the residence as well as Raleigh-Durham International Airport. This property is closely monitored with a video surveillance system as well as an active alarm system. For an exclusive viewing of this property please contact to schedule a showing. You may not enter the property without first contacting. We kindly request a 36-48 hour notice in advance. Showings are for serious, qualified buyers only. For a birds eye view of the property visit our MapRight mapping system. Simply copy and paste this link into your browser mapright/. com/ranching/maps/9d34fbab01d04c5723afc41b9/share and then click on any of the icons to see photographs taken from those exact locations as well as drone photos taken from the air. Click around and change the base layers to view shaded relief or hydrology maps of the area. For more information on this and other Residential and Pasture Land For Sale in Edgecombe County NC, contact at , by email at Email listed above, or visit Nclandandfarms/. Com.